Immune thrombocytopenia; Platelet count; Helicobacter pylori; Eradication therapy; CagA. Immune thrombocytopenia (ITP), first described by P.G.Werlhof, is the most common autoimmune haematologic disorder, affecting individuals of all genders, races and ages. The former designation “idiopathic” was coined because in most of cases, the underlying aetiology was mysterious. However, in recent decades, the list of aetiologies of ITP has been canonically increasing, so the term “idiopathic” is becoming outdated, and instead replaced by “immune” thrombocytopenia. The disease is mediated by anti-platelet autoantibodies that bind to platelets and megakaryocytes, enhancing platelet destruction by the reticulo-endothelial system (RES) and suppressing megakaryopoiesis. Most of these antibodies are directed against platelet membrane glycoprotein (GP) complexes; GPIIb/IIIa or GPIbIX. In adults, ITP typically has an insidious onset, with no preceding viral or other illness and has a chronic course. The symptoms and signs of ITP in adult patients are highly diverse and range from the fairly common asymptomatic patient with mild bruising and mucosal bleeding (e.g. oral or gastrointestinal tract) to frank haemorrhage from anybody site, the most catastrophic of which is intracranial. Helicobacter pylori is a Gram-negative, microaerophilic, spiral-shaped, flagellated bacterium that colonizes the human gastric mucosal layer. This bacterium was first isolated from gastric biopsy by Robin Warren and Barry Marshall in 1984. H. pylori has been implicated in the aetiology of a spectrum of gastrointestinal diseases, including; peptic ulcer disease, gastric cancer and MALToma (mucosa-associated lymphoid tissue lymphoma). In addition to gastric disorders, this pathogen is associated with various non-gastrointestinal-related illnesses such as ITP, coronary artery disease, Alzheimer’s disease, iron deficiency anaemia, as well as a variety of autoimmune disorders. The pertinence between H. pylori infection and ITP was first reported in 1998, by an Italian group who perceived a marked increase in the platelet count in 8 out of 11 patients after receipt of eradication therapy. Subsequently, other co-workers revealed that eradication of H. pylori infection among patients with ITP resulted into a substantial and steady increase in the platelet count in more than half of the treated patients. However, other investigators yielded contradictory results regarding restoration of platelet counts in ITP patients after achievement of H. pylori eradication. The cytotoxin-associated gene A (CagA) protein, the product of the CagA gene, is one of the major H. pylori virulence factors. Currently, CagA positive H. pylori strains are proposed to play a role in the pathogenesis of ITP. It is postulated that molecular mimicry between H. pylori CagA protein and various platelets’ glycoprotein antigens could induce anti-glycoprotein auto-antibody production that cross react with host platelets. Accordingly, this study was undertaken to: (i) verify the prevalence of H. pylori infection in adult patients with ITP, (ii) interrogate the impact of H. pylori eradication therapy on platelet counts among enrolled patients with H. pylori-associated ITP, (iii) find out a prognostic factor for platelet recovery in H. pylori-infected ITP patients. This is a prospective cohort study, conducted over a period of 12 months starting from October 2014 to September 2015. The study included 60 consecutive patients (22 males and 38 females; 1:1.7) newly diagnosed with ITP who attended the Outpatient Clinic of Haematology, Oncology Center of Mansoura University (OCMU), Mansoura, Egypt. The inclusion criteria included patients > 18 years of age diagnosed with ITP according to American Society of Haematology criteria based on an initial platelet count < 100 x 10³/μL. To avoid the confusing effect of incident ITP therapies, patients were eligible for the study if they had a platelet count above 20 x 10³/μL and below 100 x 10³/μL, and did not require treatment for thrombocytopenia for at least 3 months before their inclusion. A bone marrow examination was performed in all patients to rule out other causes of thrombocytopenia. Patients with other causes of thrombocytopenia such as HCV, HBV, or HIV infections, drugs, lymphoproliferative disorders, autoimmune disorders and pseudothrombocytopenia had been excluded. Furthermore, patients who had active life threatening bleeding at the time of recruitment were excluded. Helicobacter pylori infection was determined by detection of H. pylori antigens in stool specimens through faecal H. pylori antigen enzyme linked immunosorbent assay (ELISA) kit. Assay procedure was done as per manufacturer’s instructions [AccuDiag™, Inc., USA]. The optical density (OD) of each well was read at 450 nm on a microwell reader. Sera were obtained from H. pylori-infected patients with ITP and stored at -20 °C until serological testing was done. An ELISA kit was used and the procedure was done according to the manufacturer’s instructions [RADIM, Italy]. Patients who had H. pylori infection were given standard triple eradication regimen for H. pylori comprising; amoxicillin 1000 mg twice daily, clarithromycin 500 mg twice daily and pantoprazole 40 mg twice daily for 1 week. On the other hand, patients without H. pylori infection received no eradication therapy and were followed up as a control group. Serum levels of anti-CagA IgG were assessed before and after therapy to demonstrate the significant correlation of titer decline and response. Platelet counts were assessed at the time of testing (baseline), then 2 and 6 months after completion of treatment. Success of eradication of H. pylori infection was determined by repetition of H. pylori faecal antigen testing 4 weeks after treatment withdrawal. The clinical response to treatment was defined according to the guidelines of the International Working Group (IWG) on ITP. All Statistical analyses were performed by using IBM SPSS 22.0 software version for windows (SPSS, Inc., Chicago, IL, USA). Data were expressed as either the number (percentage) or median (range). The Mann-Whitney test was used to compare means between 2 groups. The Kruskal-Wallis test was used to compare the mean platelet counts between groups during the follow up period. Fisher’s exact test was used to analyze the statistical significance associated with anti-CagA IgG presence. The differences as regard to anti-CagA IgG before and after therapy were analyzed using the Wilcoxon’s test. P values of < 0.05 were considered to be statistically significant. As the prevalence of H. pylori infection in adult patients with ITP was the primary outcome of this research, study power was calculated online (www.dssresearch.com) using the sample percentage (33.3%) and considering the worst acceptable value as 30.3%, the sample size was 60 with 95% confidence level. The study power was found to be 8.6% which is low due to small sample size. The present study involved 60 consecutive patients newly diagnosed with ITP (36.7% males and 63.3% females) with age ranging between 29 and 59 years (median age; 45 years). The median disease duration for the involved subjects was 6 months (ranging from 3 - 12 months). The median baseline platelet count was 34 × 10³/μL (23 - 67 × 10³/μL). The most common clinical manifestation was petechiae (52.9%), followed by gum bleeding (38%), menorrhagia (32.4%) and epistaxis (12.9%). H. pylori infection was detected in 20 out of the 60 ITP patients (33.3%) by faecal H. pylori antigen ELISA kit. [The patients’ baseline characteristics are shown in table 1]. Legend: Data are expressed as either the number (percentage) or median (range). Abbreviations: H. pylori: Helicobacter pylori. In the current work, no significant difference (p = 0.5) was noticed in the baseline platelet counts between the H. pylori negative group (n = 40), H.pylori-positive-treatment responder group (n = 13) who exhibited complete response (CR) to eradication therapy [as per IWG criteria] and the H. pylori-positive- treatment non-responder group (n = 7). However, 2 months after eradication therapy, the platelet counts increased significantly from 34 (29 - 51) × 103/μL to 103 (100 - 123) × 103/μL in the H. pylori-positive-treatment responder group (p = 0.0001) in comparison to that of the H. pylori-positive-treatment non-responder group (p = 0.01) and to the H. pylori negative group (p = 0.01). Furthermore, 6 months after eradication therapy, the platelet counts displayed a significant increase in the treatment responder group in comparison to the treatment non-responder group and the H. pylori negative group (p = 0.0001) [values are mentioned in table 2]. In addition, the platelet recovery was sustained over the follow-up period. Concerning the presence of anti-CagA IgG in the H.pylori-infected patients as determined by ELISA, a significant difference was observed between both treatment responders and treatment non-responders [92.3% versus 71.4% respectively; p = 0.01]. It is worth mentioning that the initial titers of anti-CagA IgG were significantly higher in ITP patients responding to H. pylori eradication compared to the non-responding group [69 relative unit (RU)/mL (63 - 78) versus 38 RU/mL (36 - 40); p = 0.01] (Figure 1). Moreover, the decline in the titers of anti-CagA IgG after eradication therapy was statistically significant in the treatment-responders (p = 0.005) in comparison to the non-responders (p = 0.1) as determined by the Wilcoxon’s test [values are shown in table 2]. Table 2: Comparison of the patient’s characteristics between H. pylori-positive-treatment responders, H. pylori-positive-treatment non-responders and H. pylori negative group. Legend: Data are expressed as median (range) or number (percentage). Abbreviations: H. pylori: Helicobacter pylori; Anti-CagA: anti-cytotoxin associated gene A; RU/mL: relative unit/mL; ND: not determined. Figure 1: The titers of anti-CagAIgG before eradication therapy in H.pylori-infected ITP patients. 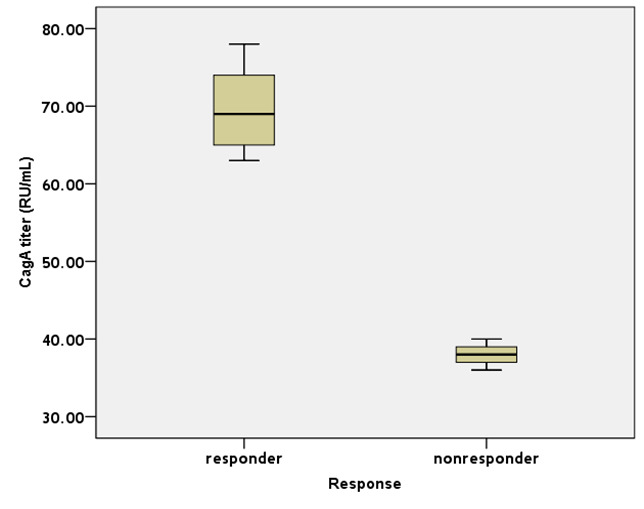 The ELISA titers of serum anti-CagAIgG in the responder group were significantly higher than those in the non-responders (p = 0.01). Values represent the median (range) expressed in RU/mL (relative unit/mL). The pathogenesis of H. pylori-associated ITP is still ambiguous, although several hypotheses have been proposed. One is that H. pylori components may mimic the molecular make-up of platelet antigens, so antibodies to H. pylori components may cross react with platelet surface antigens. In the present work, the prevalence of H. pylori infection in ITP patients was 33.3% (20 out of 60 ITP patients). This finding is compatible with that reported by Hwang., et al (2016) where H. pylori infection was detected in 41.1% of their involved group, even though lower rates were published in other studies accounting for 22% and 11.1%, respectively[18,19]. It seems that diverse racial, industrial and social conditions prevailed in the studied populations could contribute to such disparity. Although some authors claimed higher prevalence of H. pylori infection among younger patients and others reported predominance of infection among older patients, our study realized no significant difference attributed to age distribution which is in common to other investigators. Additionally, the gender distribution between our groups was similar (p = 0.2), comparable to what mentioned by other co-workers. Besides, no statistically significant difference was detected between H.pylori-infected group and non-infected group in terms of duration of ITP (p = 0.5) which is concomitant with an earlier review. In the existent work, out of the 20 H. pylori-infected ITP patients, 65% showed complete platelet response (CR) to eradication therapy of H. pylori (designated as responder group), whereas 35% were non-responders [as per IWG criteria]. Similarly agreeable results were described by several Japanese groups including; Hino., et al (2003), and Asahi., et al (2006). Likewise, an earlier Italian report by Emilia., et al (2002) informed 66.7% response rate to eradication regimen. Nonetheless, Campuzano-Maya (2007) yielded a higher platelet response up to 80.8% from a retrospective study carried out in Colombia (Latin America). The high rate deduced from this retrospective study could be ascribed to recall bias or selection bias, unlike the results of prospective trials. Recently, Chey., et al (2017) accomplished a systematic review of 25 studies, all of which encompassed at least 15 adult patients. Consequently, they inferred that platelet counts in ITP patients displayed a significant rise after H. pylori eradication therapy. Also, Franchini. et al (2017) suggested that the eradication of H. pylori in infected patients with ITP will safeguard those patients from other aggressive and prolonged treatment options. In contrast to our study, several researchers have rebutted a significant link between H. pylori and ITP. For example, Jarque., et al (2001), from a study conducted in Spain, concluded that only 3 out of 23 (13%) patients with ITP in whom H. pylori was eradicated experienced a significant increase in the platelet count. Furthermore, Michel and colleagues (2004) disclosed that only one out of 14 North American ITP patients who responded to H. pylori eradication had a rise in platelet count. Ahn., et al (2006), too, described a poor response to H. pylori eradication therapy in patients with ITP in the United States accounting only for 6.7%. The discrepancy among different groups regarding the response to H. pylori eradication therapy among ITP patients could be attributed to several reasons. Firstly, a positive correlation is established between the prevalence of H. pylori infection and the platelet response through which the response rate is higher in countries with higher prevalence of H. pylori infection like Japan[24,25] and Latin America[27,33]. On the contrary, studies performed in North America announced poor response rate to eradication treatment that parallel the low prevalence of H. pylori infection[31,32]. Secondly, variation in the patients’ characteristics including their genetic constitution, could also contribute to the discordant outcomes of eradication therapy in these studies. Lastly, the infecting strains of H. pylori and their virulence determinants, such as CagA expression might induce variability in ITP response to H. pylori eradication. The present data demonstrated that ITP patients responsive to H. pylori eradication had initially higher titers of anti-CagA IgG compared to non-responsive group (p = 0.01). Moreover, the decline in the titers of anti-CagA IgG after eradication therapy was statistically significant in the treatment-responders (p = 0.005) in comparison to the non-responders (p = 0.1). That being the case, the difference in the anti-CagA IgG status could be used as a predictor of platelet response to eradication therapy of H. pylori. In accordance with our results, Suzuki., et al (2005) mentioned that among patients with ITP, the titers of anti-CagA IgG were significantly higher in responders than in non-responders (p = 0.04). Furthermore, Kodama., et al (2007) reported a significant reduction in the titer of anti-CagA IgG after eradication therapy in the responder group compared to the non-responders. They proposed that the immune response of the patients to CagA protein may be prolonged after H. pylori eradication in the non-responders. Globally, the results of this study affirmed that H. pylori eradication has a positive impact on platelet counts in adult patients with ITP. Thereby, we endorse initial screening of all ITP patients for H. pylori infection and considering eradication therapy for the infected patients. Currently, most of the available treatment modalities of ITP are costly, together with undesirable adverse effects. On the other hand, H. pylori eradication therapy is economical with tolerable side effects. So, this strategy will be beneficial particularly in developing countries like ours. Additionally, we advocate routine inquiry for serum titers of anti-CagA IgG in those patients as a prognostic marker for platelet recovery after eradication therapy. The protocol of this study was reviewed and approved by our institutional review board (R/16.05.85). All procedures were performed in accordance with the ethical standards of the institutional research committee and with Helsinki declaration. Informed consent was obtained from all participants included in this study. 1. Imbach, P., Kuhne, T., Signer, E. Historical aspects and present knowledge of idiopathic thrombocytopenic pur¬pura. (2002) Br J Haematol 119: 894-900. 2. Fogarty, P.F., Segal, J.B. The epidemiology of immune thrombocytopenic purpura. (2007) Curr Opin Hematol 14(5): 515-519. 3. Stasi, R., Newland, A.C.ITP: a historical perspective. (2011) Br J Haematol 153(4): 437-450. 4. McMillan, R. Antiplatelet antibodies in chronic immune thrombocytopenia and their role in platelet destruction and defective platelet production. (2009) Hematol Oncol Clin North Am 23(6): 1163-1175. 5. Stasi, R., Provan, D. Management of immune thrombocytopenic purpura in adults. (2004) Mayo Clin Proc 79(4): 504-522. 6. Logan, R.P., Walker, M.M. ABC of the upper gastrointestinal tract: epidemiology and diagnosis of Helicobacterpylori infection. (2001) Br Med J 323: 920-922. 7. Marshall, B.J., Warren, R.M. Unidentified curved bacilli in the stomach of patients with gastritis and peptic ulceration. (1984) Lancet 16: 1311-1315. 8. McColl, K.E. Helicobacterpylori infection. (2010) N Engl J Med 362: 1597-1604. 9. Wong, F., Rayner-Hartley, E., Byrne, M.F. Extraintestinal manifestations of Helicobacterpylori: A concise review. (2014) World J Gastroenterol 20(34): 11950-11961. 10. Gasbarrini, A., Franceschi, F., Tartaglione, R., et al. Regression of autoimmune throm-bocytopenia after eradication of Helicobacter pylori. (1998) Lancet 352: 878. 11. Kohda, K., Kuga, T., Kogawa, K., et al. Effect of Helicobacter pylori eradication on platelet recovery in Japanese patients with chronic idiopathic thrombocytopenic purpura and secondary autoimmune thrombocytopenic purpura. (2002) Br J Haematol 118(2): 584-588. 12. Michel, M., Khellaf, M., Desforges, L., et al. Autoimmune thrombocytopenic purpura and Helicobacter pylori infection. (2002) Arch Intern Med 162:1033-1036. 13. Cheng, Y.S., Kuang, L.P., Zhuang, C.L., et al. Effects of cytotoxin-associated gene A (CagA) positive Helicobacter pylori infection on anti-platelet glycoprotein antibody producing B cells in patients with primary idiopathic thrombocytopenic purpura (ITP). (2015) Pak J Med Sci 31(1): 121-126. 14. George, J.N., Woolf, S.H., Raskob, et al. Idiopathic thrombocytopenic purpura: a practice guideline developed by explicit methods for the American Society of Hematology. (1996) Blood 88: 3-40. 15. Rodeghiero, F., Stasi, R., Gernsheimer, T., et al. Standardization of terminology, definitions and outcome criteria in immune thrombocytopenic purpura of adults and children: report from an international working group. (2009) Blood 113(11): 2386-2393. 16. Takahashi, T., Yujiri, T., Shinohara, K., et al. Molecular mimicry by Helicobacter pylori CagA protein may be involved in the pathogenesis of H. pylori-associated chronic idiopathic thrombocytopenic purpura. (2004) Br J Haematol 124: 91-96. 17. Hwang, J.J., Lee, D.H., Yoon, H., et al. The Effects of Helicobacter pylori Eradication Therapy for Chronic Idiopathic Thrombocytopenic Purpura. (2016) Gut Liver 10(3): 356-361. 18. Gan, G.G., Norfaizal, A.L., Bee, P.C., et al. Helicobacter pylori infection in chronic immune thrombocytopenic purpura patients in Malaysia. (2013) Med J Malaysia 68(3): 231-233. 19. Sultan, S., Irfan, S.M., Kaker, J., et al. Efficacy of Helicobacter pylori eradication as an upfront treatment of secondary immune thrombocytopenia: an experience from Pakistan. (2016) Med J Malaysia 71(2): 53-56. 20. Emilia, G., Longo, G., Luppi, M., et al. Helicobacter pylori eradication can induce platelet recovery in idiopathic thrombocytopenic purpura. (2001) Blood 97(3): 812-814. 21. Song, M.K., Chung, J.S., Shin, H.J., et al. Outcome of immunosuppressive therapy with Helicobacter pylori eradication therapy in patients with chronic idiopathic thrombocytopenic purpura. (2008) J Korean Med Sci 23(3): 445-451. 22. Noonavath, R.N., Lakshmi, C.P., Dutta, T.K., et al. Helicobacterpylori eradication in patients with chronic immune thrombocytopenic purpura. (2014) World J Gastroenterol 20(22): 6918-6923. 23. Ando, K., Shimamoto, T., Tauchi, T., et al. Can eradication therapy for Helicobacterpylori really improve the thrombocytopenia in idiopathic thrombocytopenic purpura? Our experience and a literature review. (2003) Int J Hematol 77(3): 239-244. 24. Hino, M., Yamane, T., Park, K., et al. Platelet recovery after eradication of Helicobacter pylori in patients with idiopathic thrombocytopenic purpura. (2003) Ann Hematol 82: 30-32. 25. Asahi, A., Kuwana, M., Suzuki, H., et al. Effects of a Helicobacter pylori eradication regimen on anti-platelet autoantibody response in infected and uninfected patients with idiopathic thrombocytopenic purpura. (2006) Haematologica 91(10): 1436-1437. 26. Emilia, G., Luppi, M., Morselli, M., et al. Helicobacter pylori infection and idiopathic thrombocytopenic purpura. (2002) Br J Haematol 118: 1198-1199. 27. Campuzano-Maya, G. Proof of an association between Helicobacter pylori and idiopathic thrombocytopenic purpura in Latin America. (2007) Helicobacter 12(3): 265-273. 28. Chey, W.D., Leontiadis, G.I., Howden, C.W., et al. ACG Clinical Guideline: Treatment of Helicobacter pylori Infection. (2017) Am J Gastroenterol 112(2): 212-239. 29. Franchini, M., Veneri, D., Lippi, G. Thrombocytopenia and infections. (2017) Expert Rev Hematol 10(1): 99-106. 30. Jarque, I., Andreu, R., Llopis, I., et al. Absence of platelet response after eradication of Helicobacter pylori infection in patients with chronic idiopathic thrombocytopenic purpura. (2001) Br J Haematol 115(4): 1002-1003. 31. Michel, M., Cooper, N., Jean, C., et al. Does Helicobater pylori initiate or perpetuate immune thrombocytopenic purpura? (2004) Blood 103(3): 890-896. 32. Ahn, E., Tiede, M., Jy, W., et al. Platelet activation in Helicobacter pylori-associated idiopathic thrombocytopenic purpura: eradication reduces platelet activation but seldom improves platelet counts. (2006) Haematologica 116(1): 19-24. 33. Lyra, A.C., Santana, G., Santana, N., et al. Seroprevalence and risk factors associated with Helicobacter pylori infection in blood donors in Salvador, Northeast-Brazil. (2003) Braz J Infect Dis 7(5): 339-345. 34. Suzuki, T., Matsushima, M., Masui, A., et al. Effect of Helicobacter pylori eradication in patients with chronic idiopathic thrombocytopenic purpura-a randomized controlled trial. (2005) Am J Gastroenterol 100: 1265-1270. 35. Kodama, M., Kitadai, Y., Ito, M., et al. Immune response to CagA protein is associated with improved platelet count after Helicobacter pylori eradication in patients with idiopathic thrombocytopenic purpura. (2007) Helicobacter 12(1): 36-42.